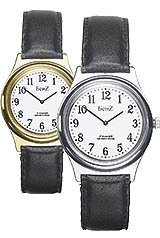 I had 2 or 3 Timex watches at verious times but I kept losing them or I forgot to wind them (there were no battery powered watches back then, or at least none that I know of)! Until 1957 when a bought a Bulova self winding wristwatch...which I still have 50+ years after buying on it...the other watches were bought by my parents! I still own two working wind-up watches. I prefer them because I don't have to spend $ replacing a battery. Of course, today many people simply rely on their cell phones for the current time. Never mind that it's a lot easier to take a quick look at your wrist vs. pull your cell phone out of your pocket or purse. TIMEX takes a licking and keeps on ticking.